The Supportive Services for Veteran Families (SSVF) program represents a crucial component of the U.S. Department of Veterans Affairs’ (VA) plan to prevent and end homelessness among Veterans. Operationalized in Federal Fiscal Year (FY) 2012, SSVF is the first and only VA program that provides services to Veterans and their families. SSVF is a community-based, competitive grant program that rapidly re-houses homeless Veteran families and prevents homelessness for those at imminent risk due to a housing crisis. The program focuses on achieving housing stability through a short-term, customized intervention using a time limited case management approach. Services include financial assistance to offset move-in costs or remediate rental arrears; help in locating housing; landlord mediation services; financial management and credit counseling; support for child care and transportation; and assistance with accessing healthcare and other supportive services. SSVF employs a Housing First model, which prioritizes access to permanent rental housing as quickly as possible, without preconditions. SSVF providers concentrate on helping Veterans increase their income through employment and benefits while addressing issues that can interfere with housing stability. This brief summarizes the impact and performance of the SSVF program during its second year of operation in FY 2013, drawing comparisons, where relevant, with the information presented for FY 2012 in a previous report1. 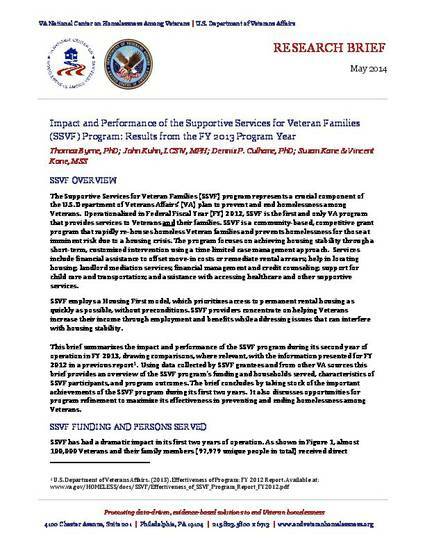 Using data collected by SSVF grantees and from other VA sources this brief provides an overview of the SSVF program's funding and households served, characteristics of SSVF participants, and program outcomes. The brief concludes by taking stock of the important achievements of the SSVF program during its first two years. It also discusses opportunities for program refinement to maximize its effectiveness in preventing and ending homelessness among Veterans.